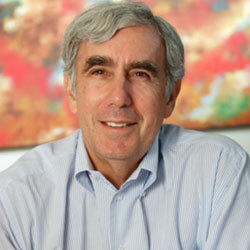 David Krieger is a founder of the Nuclear Age Peace Foundation, and has served as President of the Foundation since 1982. Under his leadership the Foundation has initiated many innovative and important projects for building peace, strengthening international law, abolishing nuclear weapons and empowering new peace leaders. Dr. Krieger has lectured throughout the United States, Europe and Asia on issues of peace, security, international law, and the abolition of nuclear weapons. He has received many awards for his work for a more peaceful and nuclear weapons-free world, including three awards for Peace Writing by the OMNI Center for Peace, Justice and Ecology for his three books of poetry. He has been interviewed on CNN, MSNBC and many other national and international television and radio shows. Dr. Krieger holds leadership positions in many other civil society organizations working for peace and the abolition of nuclear weapons. He is one of 50 Councilors of the World Future Council, which seeks to be a voice for future generations, and serves as chair of the Council’s Peace and Disarmament Working Group. He is the Chair of the Executive Committee of the International Network of Engineers and Scientists for Global Responsibility. He also serves as a member of the Executive Committee and International Steering Committee of the Middle Powers Initiative, which works with middle power governments to promote progress toward nuclear disarmament. Dr. Krieger is a founder and a member of the Global Council of Abolition 2000, a global network of over 2000 organizations and municipalities committed to the total elimination of nuclear weapons. He is the author of many studies of peace in the Nuclear Age. He has written or edited more than 20 volumes and has written hundreds of articles and book chapters. His latest book is The Path to Zero: Dialogues on Nuclear Dangers (2012). Other books he has written or edited are: Never Enough Flowers: The Poetry of Peace II (2012) Speaking of Peace: Quotations to Inspire Action (2011); God’s Tears; Reflections on the Atomic Bombs Dropped on Hiroshima and Nagasaki (2010), published in Japanese and English; The Challenge of Abolishing Nuclear Weapons (2009); At the Nuclear Precipice: Catastrophe or Transformation? (2008); The Doves Flew High (2007); Joseph Rotblat – Visionary for Peace (2007); Today Is Not a Good Day for War (2005); Hold Hope, Wage Peace (2005); Einstein – Peace Now! (2005); Peace 100 Ideas (2003); Hope in a Dark Time, Reflections on Humanity’s Future (2003); The Poetry of Peace (2003); Choose Hope, Your Role in Waging Peace in the Nuclear Age (2002); A Maginot Line in the Sky; International Perspectives on Ballistic Missile Defense (2001); Nuclear Weapons and the World Court (1998); Waging Peace II, Vision and Hope for the 21st Century (1992); Waging Peace in the Nuclear Age, Ideas for Action (1988); Disarmament and Development: The Challenge of the International Control and Management of Dual-Purpose Technologies (1981); and The Tides of Change, Peace, Pollution and Potential of the Oceans (1975). Dr. Krieger is the recipient of the Earth Charter Award for Democracy, Nonviolence and Peace by Citizens for Peaceful Resolutions (2011); the PeaceWriting Award for Poetry of the OMNI Center for Peace, Justice and Ecology (2010); The Golden Dove (2009); Occidental College Alumnus of the Year (2008); the PeaceWriting Award for Poetry of the Peace and Justice Studies Association and OMNI Center for Peace, Justice and Ecology (2007); the Freedom from War Peace Leadership Award (2006); Global Green’s Millennium Award for International Environmental Leadership (2005); the PeaceWriting Award for Poetry of the Peace and Justice Studies Association and OMNI Center for Peace, Justice and Ecology (2005); the Peace Educator of the Year Award of the Consortium of Peace Research, Education and Development (2001); the Gakudo Peace Award of the Ozaki Yukio Memorial Foundation (2001); Soka Gakkai Hiroshima Peace Award (2000); Peace Award of the International Journal of Humanities and Peace (2000); Soka Gakkai International Peace and Culture Award (1997); Soka University Award of Highest Honor (1997); Peace Award of the War and Peace Foundation (1996); Big Canvas Award of Santa Barbara Magazine (1996); and the Bronze Medal of the Hungarian Engineers for Peace (1995). He serves on the Advisory Council of Free the Children International (Toronto), Bianca Jagger Human Rights Foundation (London), Right Livelihood Foundation (Sweden), the International Council of the Institute on the Holocaust and Genocide (Israel), the International Institute for Peace (Vienna), Mahatma Gandhi Center for Global Nonviolence (Virginia), Mayors for Peace (Hiroshima), the Peace Resources Cooperative (Yokohama), the Transnational Foundation for Peace and Future Research (Sweden), the Lawyers Committee on Nuclear Policy (New York), the Foundation for Conscious Evolution (Santa Barbara), and Peace Media (peacejournalism.com). He is a member of the Committee of 100 for Tibet. Dr. Krieger served as Panel Chair of the Citizens’ Hearing on the Legality of U.S. Actions in Iraq, held in Tacoma, Washington in 2007, and as a member of the Jury of Conscience of the World Tribunal on Iraq, held in Istanbul in 2005. In his early career he was an Assistant Professor at the University of Hawaii and San Francisco State University. He worked at the Center for the Study of Democratic Institutions on issues of international law, ocean governance, nuclear terrorism and disarmament; and at the Foundation for Reshaping the International Order (RIO Foundation) in the Netherlands on the effects of dual-purpose technologies on disarmament, development and the environment. He is a graduate of Occidental College, and holds MA and Ph.D. degrees in political science from the University of Hawaii as well as a J.D. from the Santa Barbara College of Law. Dr. Krieger served for 20 years as a judge pro tem for the Santa Barbara Superior Court. He is married and has three children. His interests include tennis, hiking and poetry.